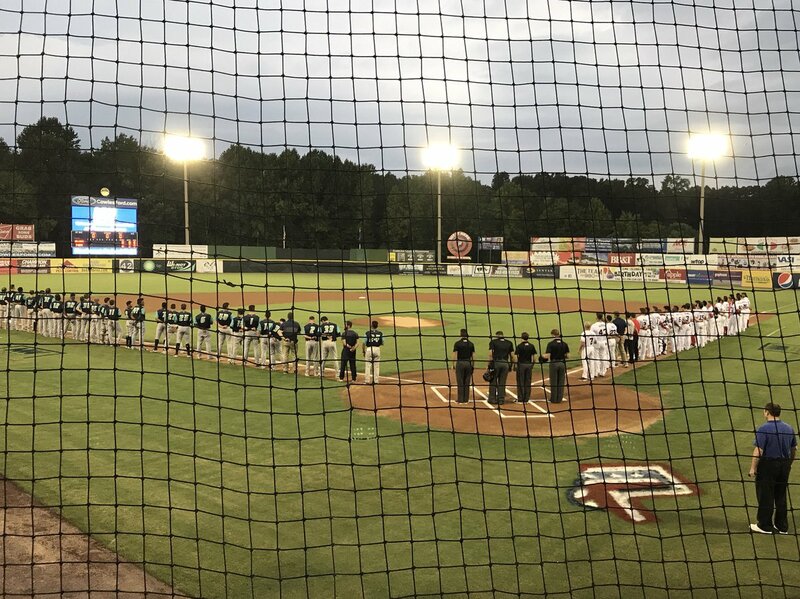 Twice Potomac took advantage of sloppy Lynchburg defense to score two runs on three singles to build a 4-0 lead, which seemed like it would have been enough to win the game when the rains came with one out in the top of the 6th. Instead, they’ll continue it this afternoon with a runner on 1st, then play a nine-inning game. Why this is as opposed to two years ago when the game was called with Potomac leading 7-0 after 6½ innings is not clear, aside from perhaps that the playoff format is different this year (in 2016 it was a best of three and travel schedule was much tighter) or that the decision was made by Carolina League officials under Rule 7.02 (4.12) which has multiple exceptions for the minor leagues. The rains also ruined a night where Kyle Johnston was Dr. Jekyll instead of Mr. Hyde as he was working on a two-hit shutout through five and a 1/3rd innings. While he still overthrew several times, letting out a loud grunt a la fellow Texan Nolan Ryan, he also broke off a couple of offspeed pitches that badly fooled Hillcat hitters, who were expecting yet another fastball. ESPN has learned That’s one of the key differences between throwing and pitching. Offensively, Nick Banks drove in three with two singles and Rhett Wiseman drove in Banks in the 4th. In both innings, Lynchburg outfielders airmailed their throws in to allow runners to take second instead remaining at first. Both of those runners (Andruw Monasterio in the 2nd, Banks in the 4th) scored on singles by the very next batter. Nick Raquet (5-3, 4.91) will take the hill in the regularly scheduled game against Hillcats southpaw Kirk McCarty. Raquet faced Lynchburg once in the regular season, combining with Ben Braymer on a 1-0 shutout on August 23. McCarty pitched seven innings in a 4-2 loss to Potomac on August 24. Thanks, Luke, I hope you can make it today for the eagerly anticipated writeup. I hope this is the Nick Raquet from his last start. Luke this weather postponement sums up the season for Potomac ( and Hags ). Rain rain pain DHs. Vs. the Nick Raquet from the start prior to that where he gave up hits like a pharma rep at a Phish concert. Banks thus far in the series is 7 for 10 with a homer, two doubles, and six RBIs. I seem to remember that he had a couple of monster homers in the SEC tourney in the year he was drafted, so he apparently enjoys a playoff atmosphere.